Be the first to share your favorite memory, photo or story of Vada. This memorial page is dedicated for family, friends and future generations to celebrate the life of their loved one. 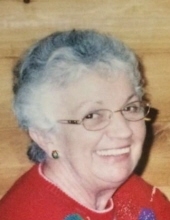 Vada Lou Tincher Clay, 77, of Meadow Bridge, passed away Wednesday, December 26, 2018, in the Bower’s Hospice House, Beckley, following a long battle with Parkinson’s Disease. Born April 14, 1941, at Rainelle, she was the daughter of the late Ethel Miller Tincher. Vada was a member of the Meadow Bridge Missionary Baptist Church, where she taught Sunday School, Vacation Bible School, and sang in the choir until her health declined. She was always willing to help where she could. Vada was a graduate of Rainelle High School and remained close to friends through the years. She was a caregiver to sick family members, when needed. She always had a smile and a heart of gold, like her mother. Vada collected teapots and loved old barns. She will be sadly missed. The family would like to thank Amanda Redden and Kris Stevens for their care of Vada. In addition to her mother, she is preceded in death by her stepfather, Howard Tincher; 2 brothers Jimmy Hess and Timmy Tincher; her daughter-in-law Gloria “Yogi” Clay; and her son-in-law Ricky Dane Riffe. Survivors include her loving husband of 58 years, Ray Clay; 1 son Ricky Clay (Robin) of Jacksonville, Florida; 2 daughters Kimberly Riffe and Jodi Hackworth (John) all of Meadow Bridge; 4 grandchildren Carson Clay of Jacksonville, Florida, Ginny Riffe of Hinton, Angel Hackworth of Marion, North Carolina, and Jessi Hackworth of Pembrooke, North Carolina; 1 great-grandson Caiman Riffe; 2 brothers Jeffrey Tincher of Crag and Randy Tincher (Rita) of Rainelle; 1 sister Robin McQuain (Butch) of Rainelle; several nieces, nephews, extended family and friends. Services will be 2:00 p.m. Saturday, December 29, at the Meadow Bridge Missionary Baptist Church with Pastor Eric Treadway and Brother Mike Whisman officiating. Burial will follow in the Patton Memorial Cemetery, Meadow Bridge. Friends may call one hour before the service from 1 – 2 p.m. at the church. To send flowers or a remembrance gift to the family of Vada Lou Tincher Clay, please visit our Tribute Store. "Email Address" would like to share the life celebration of Vada Lou Tincher Clay. Click on the "link" to go to share a favorite memory or leave a condolence message for the family.